At long last a proposal to remove the one-way system on the Clonsilla Road has been put on public display by Fingal County Council. Like many residents in the area I have campaigned against this system since it was first installed. It was extremely wasteful, achieved nothing, and served only to further isolate Clonsilla. One can only hope that by the end of this consultation process there will be funds available to complete the task. • Removal of existing carriageway narrowing build out and bollards on section of Clonsilla Road between Blanchardstown Road South and Porters Road/St. Mochtas Estate. • Construction of new road surface, kerb line and footpaths inclusive of minor widening on north side of road to facilitate reinstatement of two-way traffic on completion of works. 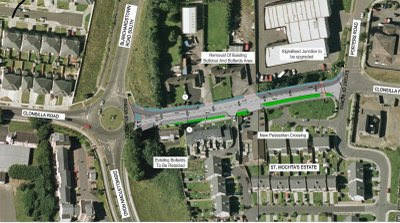 • Provide new pedestrian crossing and upgrade traffic signals at junction of Clonsilla Road/Porters Road/St. Mochtas Estate. • Provision of surface water drainage, signing and lining, directional signage and landscaping necessitated by the above works. Plans and particulars of the proposed development are on Public Display at the Fingal County Council Office, Grove Road, Blanchardstown, until Friday 13th March, 2009. Written submissions or observations with respect to the proposed development, may be made in writing to:- Tommie Mc Manus, Administrative Officer, Fingal County Council, Grove Road, Blanchardstown, Dublin 15 to arrive no later than 4.30pm on Tuesday 31st March, 2009. If you support this change it is important that you make your views known to the Council as soon as possible. Residents at the Blanchardstown end of the road are likely to object to the change with the help of some local politicians on the basis of increased traffic volumes, etc. This is only the public consultation phase and the scheme will eventually have to be voted on by the Councillors so they should have your views as well. 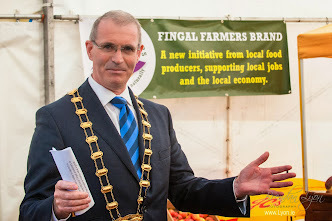 The Plans and Particulars of the proposed scheme can also be viewed on-line on the Fingal County Council website: (www.fingalcoco.ie/roads).